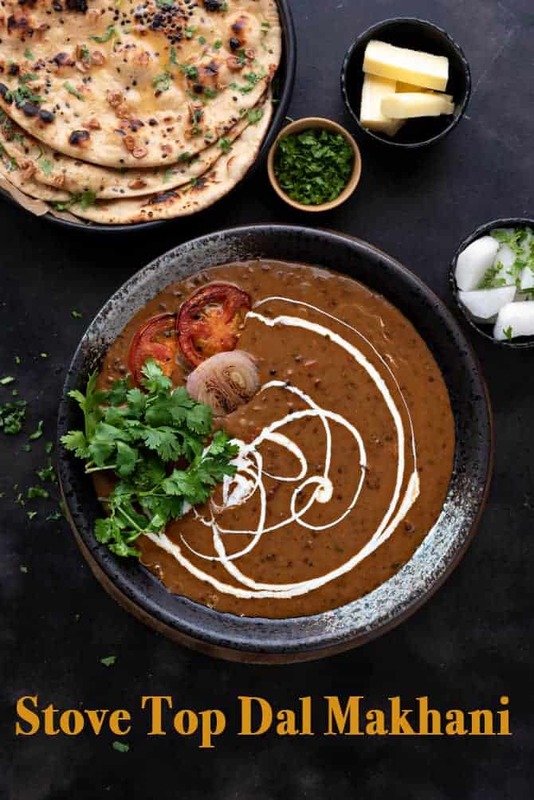 Tastiest and super easy Dal Makhani or Dal Makhni – is an ultimate kali dal recipe from Punjabi cuisine that tastes exactly like dhabas or restaurants. A luscious creamy preparation of mix of whole black lentils or sabut urad dal and rajma or kidney beans in butter, mild spices and cream. 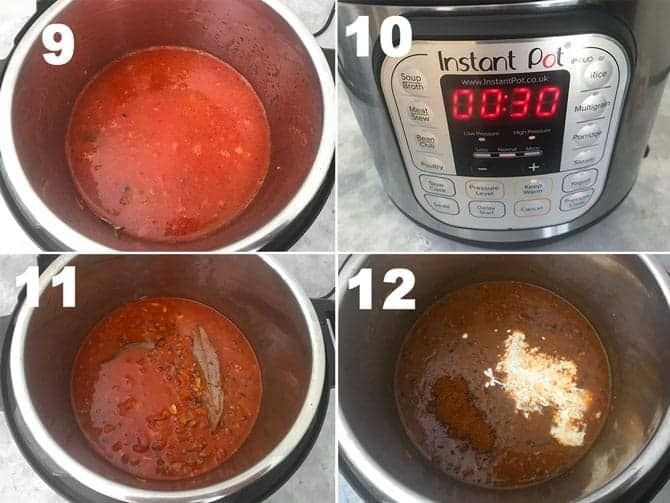 Here is how to make best dal makhani recipe on stove top and instant pot pressure cooker step by step. Dal makhani – A renowned dish, most known Indian preparation of lentil from the land of flavours – Punjab. As the name says, the word dal cite to ‘ lentils’ whereas makhani refers to ‘Buttery’. So basically it the dal lentils cooked with loads of butter and ghee or clarified butter. The authentic Punjabi dal makhani recipe consists of combination of whole black lentil (sabut urad or kali dal in hindi) and red kidney beans or rajma in hindi. Both are together cooked and seasoned with the melting butter, spices and cream. The mix of the two soaked overnight and then slow cooked together with spices, and tomato based masala in butter, ghee and cream until buttery and creamy consistency. Dal makhani is indeed a true labour of love and it will never ever give you regrets, mark my words! Do you know the secret behind the authentic restaurant style dal makhani recipe? Well, let me disclose this to you. In restaurants, it is not prepared the same day when they is usually serve it to customers. Yes, it has been cooked a day earlier, to enhance the taste of the daal blended with spices, butter and cream. The next day before serving, it has to be reheated with some butter, add a dash of kasuri methi. You may add some red chilli powder also if you wish to. There you go, now you can have the authentic restaurant style dal ready at home. Now, let me confess this, yes, I do the same since last 9 years. I prepare it a day ahead and serve it the same way next day to my family and even guests. Not even a single instance has passed, when my family and even guests did not gave me praises. Trust me guys, try it and see, you will love it i bet. In dhabas and some restaurants, you will find that, they also give coal smoke or dhungar to the dal. If you love the smoky dhaba style dal makhani then I would seriously urge you to go on ahead with the charcoal smoking step. To give the smoke or dhungar, heat a piece of charcoal (referred to as lump charcoal in US) on open flame until red hot. Place the small bowl or a piece of aluminium foil on the top the dal in pot. Drizzle teaspoon of ghee or oil. Immediately cover the pot with lid and allow the dal to absorb the smoky flavour. Open the pot after 5-7 minutes and discard the coal. Smoky dal makhni is ready to serve. So, now let’s talk about, how the authentic slow cooked dal makhani without pressure cooker is made. Traditionally, it is slow cooked on charcoal fire overnight with spices and butter. Even today, in North India, they have been cooking this dal in a same way. That taste of slow cooked kaali dal on a charcoal fire is unbeatable, by far the best. 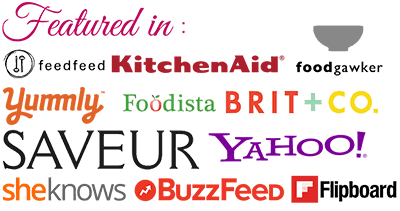 But, we being in a today’s time, are looking for instant recipes. So, making dal makhani on charcoal fire is completely out of the scenario. At least we can slow cook it on stove top for good amount of time than overnight, say for 30-45 minutes, right? And the best thing we have is Indian pressure cooker, where boiling the dal and rajma takes few minutes. 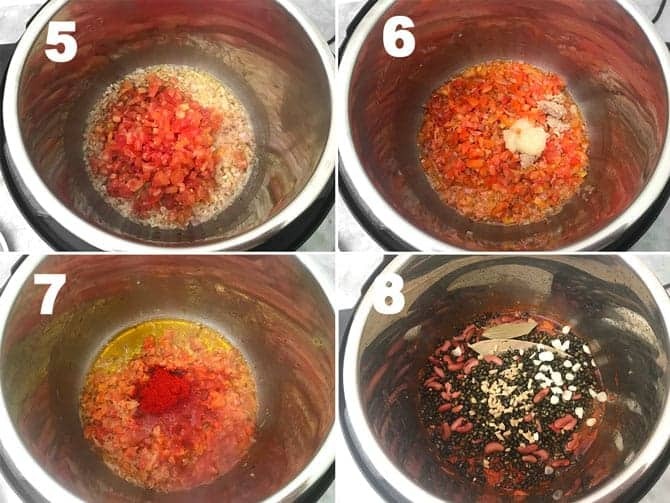 You can also opt for slow cooker, crock pot or Instant pot method. Below, I have demonstrated how to to make dal makhani in Instant pot step by step. What ingredients do we need for Punjabi Dal Makhani? Moving down to the Ingredients, make it a note that best things do take time and so does this kali dal recipe. Sabut Urad dal (whole black lentils) and Rajma (dried red kidney beans) are the two main elements of this recipe. Fresh ingredients – the fresh ingredients that goes in are ginger, garlic, tomatoes and onions. we will be needing ginger and garlic, both in chopped and paste form. Spice powders – Kashmiri Red chilli powder and garam masala powder. Well, Dal makhani actually is not spicy but with very slight sweetness and full loaded creaminess. Hence we really do not add green chillies to the dal. But, if you love it to be spicier then please go ahead with the addition of some chopped green chilies as well. Ghee and Butter – These both gives the authentic taste and richness to the dish. However, you can even use oil with butter instead of ghee. Tomato Puree – For the real restaurant dal makhani taste, please do not skip the addition of canned tomato puree. It gives so much of intensely delicious taste to the kaali dal. Fresh cream and Kasuri Methi – Either a homemade malai from fresh milk or store bought tetra pack cream, both will do perfect in this recipe. Kasuri methi gives unbeatable Punjabi flavour to the dal makhani, so please do not skip it. You may surely opt to use canned kidney beans as well. If you do so then, boil the black lentils first. Then while making the masala base for dal makhni, add boiled dal and canned kidney beans both together in the spices and allow it to slow cook for 30-45 minutes. But, let me tell you a secret to a good dal. It is always better to use dried kidney beans as anyway you will have to boil the black dal. The together cooking of both lentils and dried beans in turn will give you the best of the flavours. And yes I highly recommend you to go with the scratch cooking. 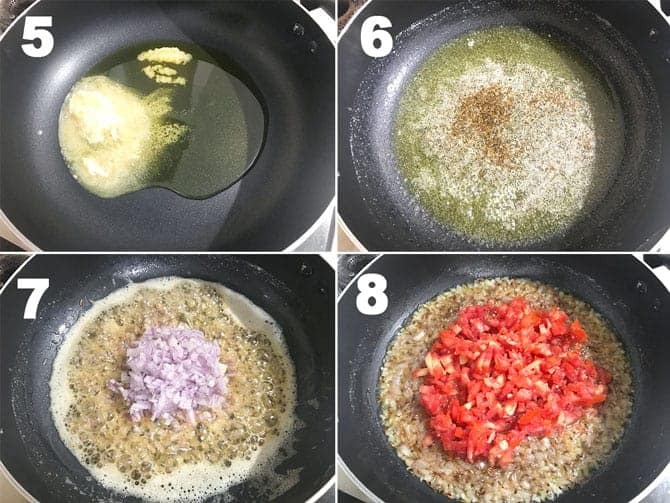 To make no onion no garlic dal makhani recipe, the only thing we need to do here is, skip chopped garlic and garlic paste along with the chopped onions. The procedure to make the recipe is, boil dal and rajma along with ginger and bay leaf only. To prepare the gravy base, melt ghee and butter together. Then, add cumin seeds, one small stick of cinnamon and 2-3 green cardamom in it. After few seconds of frying, add ginger paste and cook. 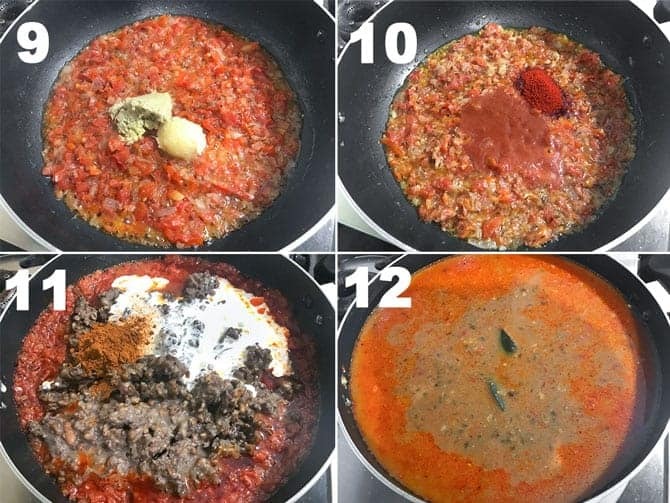 Then add chopped tomatoes and freshly pureed tomatoes and proceed with rest of the steps mentioned below. Also, you may add some dry ginger powder if you wish to. But do not forget to simmer on low heat for good 30 minutes to get restaurant style Jain dal Makhani recipe taste. 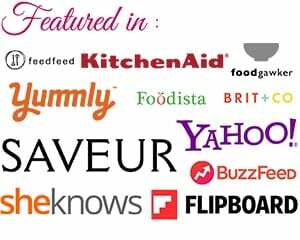 Are you looking for vegan dal makhani recipe? Well, it is not at all a difficult task to make vegan dal at home. To get that creamy flavour, add 1 tablepsoon of cashew paste or cashew cream or almond cream instead of dairy cream for the below measure. Furthermore, use vegan butter or oil instead of dairy butter and ghee. However, you can use cashew milk or almond milk also. But, i would recommend to go for cashew paste or cashew milk. On the whole, this kaali dal is definitely rich not only in flavour but the taste is absolutely divine. My family loves it to the core and they do not prefer any side servings like vegetable, kababs etc. with it. They say, “When there’s Dal Makhani, There’s no need of anything else.” In fact they quickly start tasting it even without a bread/roti or Rice. But, Dal makhni when coupled with garlic naan or even lachcha paratha and zafrani pulao or jeera rice, is an ultimate bliss. You can serve it with phulkas, parathas or even steamed rice. However, personally I do not enjoy kaali dal with phulkas. To begin with, first, mix 1 cup of black lentils or urad dal and 1/4 cup rajma together. Clean, wash and soak it for at least 8-9 hours. I usually soak it for 12 hours. 2. After soaking it, drain the water completely. In a pressure cooker, add soaked dal and rajma along with the 1 tsp of chopped ginger, 1 tsp of chopped garlic and 1 bay leaf. 3. Then add, 4 cups of water. Boil the dal and rajma mixture with chopped ginger-garlic, bay leaf until done well. It will take good 10-12 whistles to cook the dal thoroughly. If the dal and rajma is still not cooked, then add more water. Cook it for some more whistles until it is mashable. 5. In another handi or pan, heat 3 tbsp butter and 2 tbsp ghee together. 6. While the ghee and butter heats, add 1 tsp cumin seeds and allow it to crackle. 7. Then, add 1/2 cup chopped onion and fry until soft and pink. 10. Then, add 1 and 1/2 tbsp tomato puree, 1 teaspoon red chili powder and mix well. 11. After the masalas is cooked well, then add the boiled dal mixture, 1/2 cup fresh cream, salt, and 1 tsp garam masala and mix well. 12. Then add 3 cups of warm water and mix, bring it to a boil. Allow it to simmer for at least 30 minutes on a very low flame, stir occasionally to avoid burning. Note: If the water dries up in between while the dal is simmering, then add little water at a time, stir and allow it to simmer again. Usually, I simmer it for 45 minutes, because the more slow cooked dal, the better is taste. Finally, add 1 tsp of crushed kasuri methi, mix and simmer for another minute. Garnish with cream and coriander leaves. Serve hot with nan, phulka, kulcha or pulao/rice. First, clean, wash and soak 1 cup of black lentils and 1/4 cup of kidney beans in enough water overnight. 11. After the IP beeps, allow the pressure to release naturally for 10 minutes and then carefully quick release. Open the pot and mash the cooked dal with back of the ladle or potato masher to break some of them partially. 12. Now, add 1/2 cup cream and 1 tsp garam masala powder and mix. Switch on the Sauté mode and simmer for 15-20 minutes. Ensure the stirring of the dal in between to avoid anything getting stuck as the bottom. Dal will thicken gradually. Add kasuri methi and simmer for another minute or 2. Delicious creamy dal makhani is ready to serve, garnish with cream, dish out and serve. Have you tried this “Dal Makhani Recipe“? Please feed us with your ★ star ratings and comments below. Mix sabut urad dal and rajma together, clean, wash and soak it for at least 8-9 hours. In a pressure cooker, add the strained urad dal and rajma along with the chopped ginger, chopped garlic and bay leaf. Add 4 cups of water and boil the dal and rajma mixture with chopped ginger-garlic, bay leaf until done well. Once the dal is cooked, allow the pressure to release on its own. To cook dal makhani, first, heat butter and ghee together in a pan. While the ghee and butter heats, add cumin seeds and allow it to crackle. Then, add chopped onion and fry until soft and pink. Then, add tomato puree, red chili powder and mix well. After the masals is cooked well, then add the boiled dal mixture, cream, salt, garam masala and mix well. Add warm water as required and mix, bring it to a boil. Allow it to simmer for atleast 30 minutes on avery low flame, stir occasionally to avoid burning. Finally, add crushed kasuri methi, mix and simmer for another minute. Makhni Dal is ready to serve. Garnish with cream and coriander leaves. Serve hot with nan, phulka, kulcha, paratha or pulao/rice. Clean, wash and soak of black lentils and kidney beans in enough water overnight. After the IP beeps, allow the pressure to release naturally for 10 minutes and then carefully quick release. Open the pot and mash the cooked dal with back of the ladle or potato masher to break some of them partially. Now, add cream and garam masala powder and mix. Switch on the Sauté mode and simmer for 15-20 minutes. Ensure the stirring of the dal in between to avoid anything getting stuck as the bottom. Dal will thicken gradually. Add kasuri methi and simmer for another minute or 2. Delicious creamy dal makhani is ready to serve, garnish with cream, dish out and serve. 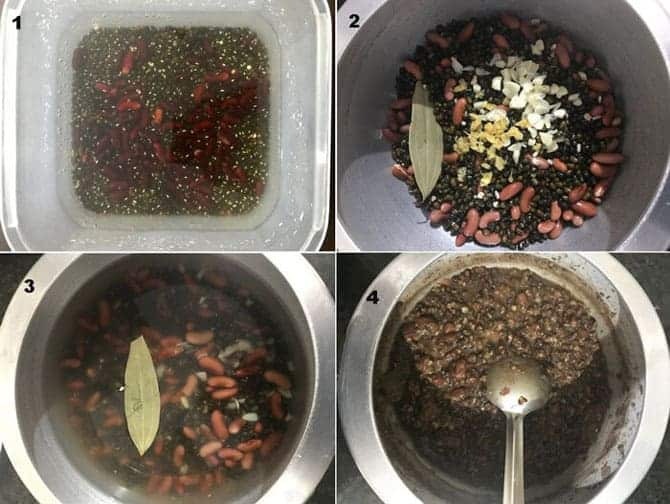 Always soak black dal and rajma for good 8 hours at least. I usually soak it for 10 hours. Do not forget to add canned tomato puree as it gives nice intense yet balanced flavor to the Dal. 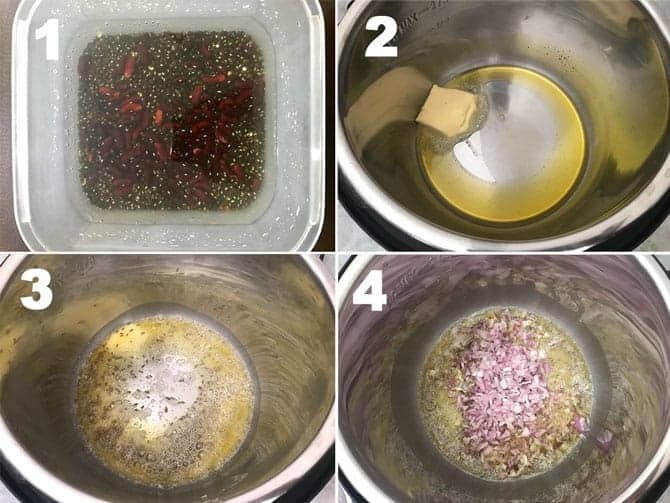 Yes, thats the secret to make any restaurant style dish at home. The more slow cooked dal, the better is the texture of Punjabi dal makhani. Simmer it for atleast 45 minutes even if you are making it in Indian pressure cooker, this will definitely give authentic creamy texture to the dal. 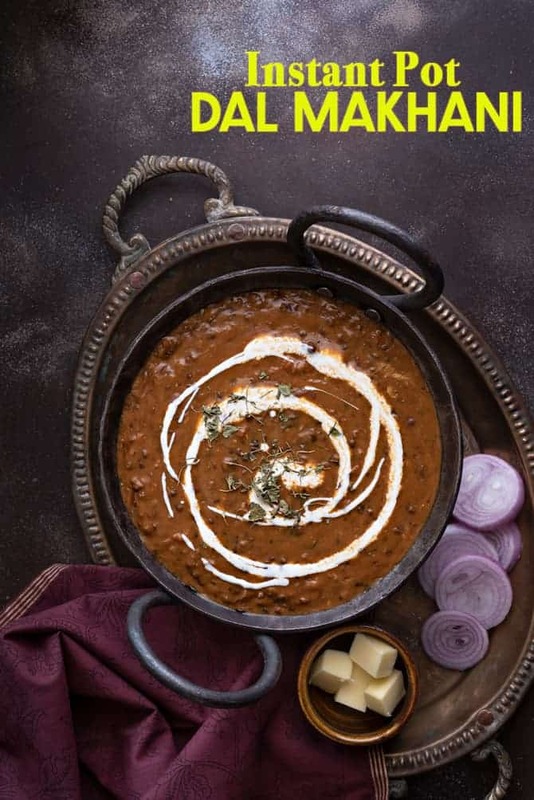 Give charcoal smoke to the dal if you wish to make smoky dhaba style dal makhani at home. Thank you for giving this step by step recipe with vegan and no garlic and no onion option! I always wanted to make vegan one. Would you have a recommendation for garam masala brand?